The Pioneer Company, MAHINUR INTERNATIONAL OVERSEAS (MIO) Was Set Up In 2016, The Core Business Of MAHINUR INTERNATIONAL OVERSEAS (MIO) Was Mainly Manpower Recruitment For Overseas Countries Such As Singapore,Malaysia,Brunei,Dubai And Saudi Arabia. 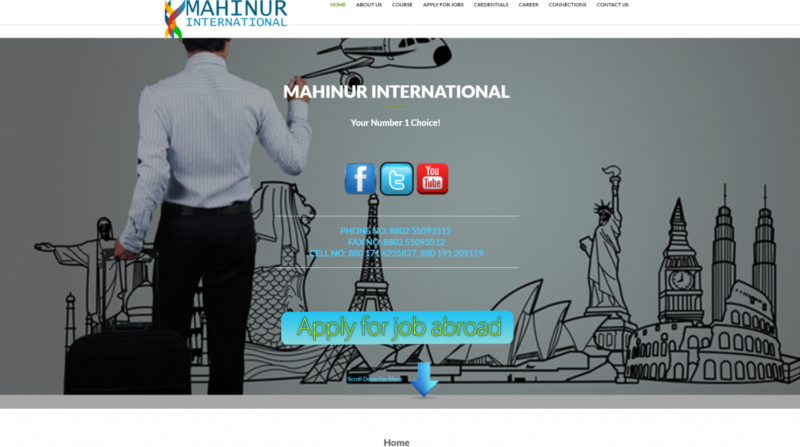 MAHINUR INTERNATIONAL OVERSEAS (MIO) Is A Well Recognized Manpower Agency Which Is Holding The License No RL- ON GOING PROCESSING ,Issued by the Ministry of Manpower, Government of the Peoples’ Republic of Bangladesh. MAHINUR INTERNATIONAL OVERSEAS (MIO) Has Supplied Mainly The Marine, Oil, Gas, Construction & Manufacturing sector.